As I’m sure most of you already know most of my social media platforms perform two functions interacting with you guys as well as my friends and family. However some of my social media platforms are solely for anything related to my blog or channel. Yes this does mean I have two profiles for some site such as Instagram and Facebook. I have to admit running two profiles is bloody hard!! I used to have two twitter profiles one for my personal tweets/family/friends and one to interact with you guys and other bloggers/youtubers. However it got to a point where I hardly used that one so I decided to merge the two and now I just have one. Another site I have two profiles for is Instagram this is because the one which most of you follow me on includes lots of posts relating to beauty products etc..Whereas my personal one has lots of photos of family and friends as well as a few selfies here and there. The reason I have two for Instagram is because I put a lot of photos of my nephews up and I like to keep them private and out of the public eye. When I mean public eye I mean they’ve never been featured on my blog or in a video for their privacy. 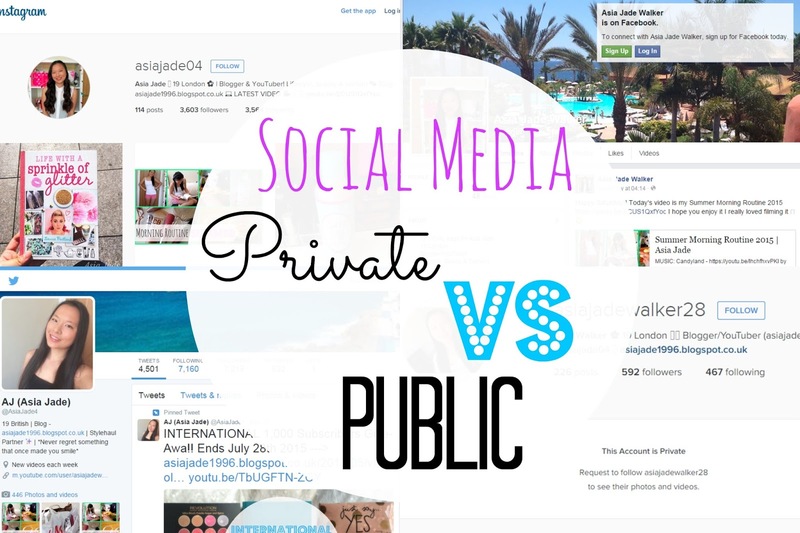 There are many reasons why a person may decide to make their social media public or private. For instance I have decided to make my Facebook page public as you guys can go over and see all the latest updates from me. Whereas my actual FB profile is private I like to keep things like that for myself, family and friends. I have a few blogger friends on it but I don’t have any readers or viewers because some of the things I post are just private. I would recommend those who want to keep their blog or youtube channels quiet creating a separate account. However as time goes on and more people know as well as you feeling more comfortable merge the two accounts. This is because it’s 10x easier to run one profile than it is two trust me I know. I forget to post on my personal Instagram all the time but I don’t want to merge them so at the moment I’m kind of stuck. Do you have two profiles for some social media platforms? or one?